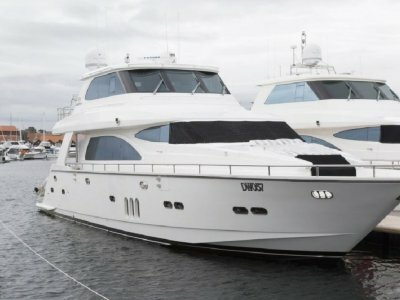 Looking for the ultimate bluewater cruiser, charter and leisure vessel? You will struggle to find a better suited vessel in this size range! It truly provides you with every luxury you may need from a cruiser, yet boasts the proven seaworthiness of the famed Southerly Designs commercial vessels. Built by Peter Milner Yachts in 2006 for the use of NBA star Luc Longley, this twin-keel dream boat is the product of the best minds in the business. 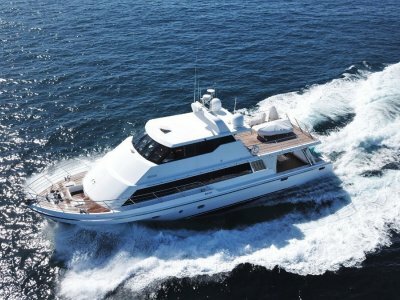 Engineered with twin MTU V10 engines churning out 1350HP a side, coupled with Twin Disc gearboxes, Bo Kooling has a sprint speed of 28 knots and a long range cruise speed of 11 knots. 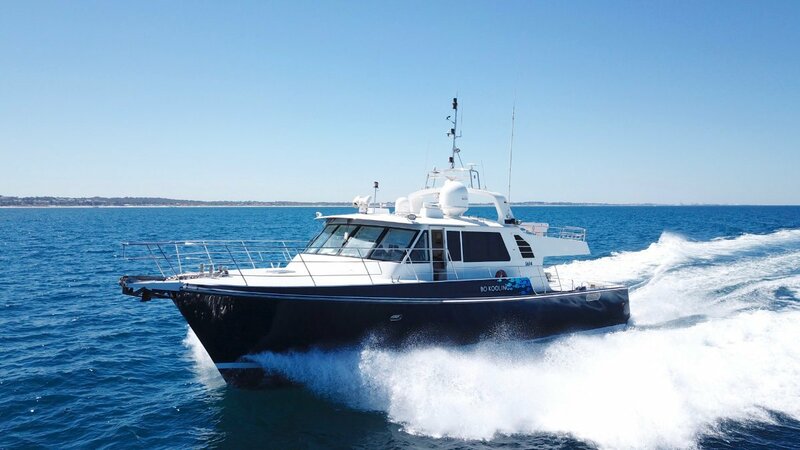 Bo Kooling has an unrivalled fuel capacity of 10,100 litres, proving handy for those extensive Kimberley tours, Montebello Island trips or circumnavigating Australian and South East Asian waters. The helm station is comfortable, completely decked out with commercial spec navigation and has impressive vision through the large windscreen. Guest and crew accommodation on board is second to none, with an expansive master cabin with full size king bed, 2 double cabins with bunks overhead and a forward V-berth with 4 singles. The largest bathroom I have seen on a 75' charter boat will ensure everyone is refreshed and comfortable, with the bathroom up on deck will mean no sand or salt is traipsed through the boat. A full sized galley will be sure to impress the most needy chefs and a dinette with seating for 8 will provide sheltered dining inside for when the weather is not so favourable or in full comfort of the aircon when cruising close to the equator. The rear deck is where the magic happens! 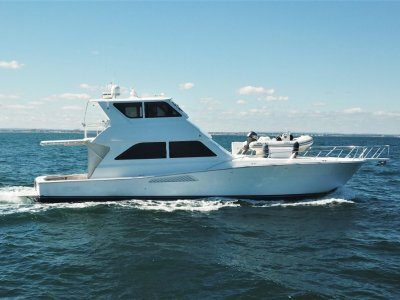 Enough space to play a test match on, entertain a large number of guests, perfect for day charter and great for fishing. A solid moulded staircase takes crew to the upper deck where the sizeable tender is launched with a hydraulic davit. Bo Kooling was launched in 2006 for former NBA basketballer Luc Longley. Luc first came to Southerly Designs in 2003 to discuss a custom designed adventure yacht. Growing up in Perth and spending many yours in his youth on the water Luc had observed many of the Southerly rock lobster boats in action and was impressed with their reputation for great performance & legendary seakeeping in Western Australia's sometimes cruel seas. Over the next 3 years Southerly developed a design with Luc suited to his exacting requirements. Built by Peter Milner Yachts in Henderson, Bo Kooling features a superb layout suited to adventure cruising backed up by commercial grade engineering systems to give peace of mind over long voyages. A unique feature of the vessel is twin heavy duty aluminium keels bonded to the composite hull structure, this gives supreme protection to the rudders & propellers and allows the vessel to beached in shallow water areas with a high tidal variation. Bo Kooling was a resounding success & has since cruised some of the most beautiful and inaccessible locations in Australia & South East asia. New Samsung LED in master cabin and saloon, 24" LCDs in additional cabins. Commercial grade fit out, fully equipped. 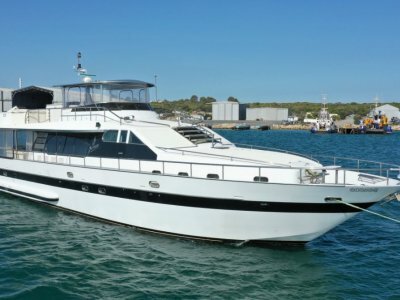 Look no further for the ultimate bluewater cruiser with prominent history in Western Australia!